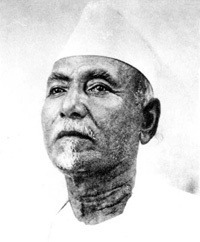 Khan, Ustad Alauddin(1862-1972) musician and sarod expert, was born in the village of Shibpur in the district of brahmanbaria, son of Sabdar Hossain Khan, also a musician. He took his first music lessons from his elder brother, fakir aftabuddin khan. At the age of ten, Alauddin Khan ran away from home to join a jatra party. His stay with this group exposed him to a variety of folk genres: jari, sari, baul, bhatiyali, kirtan, panchali. Subsequently, he went to Kolkata, where he met a generous physician named Dr Kedarnath, who helped him to become a disciple of Gopal Krishna Bhattacharya, alias Nulo Gopal, a reputed musician of Kolkata. Alauddin became his disciple with a commitment to practice sargam for twelve years. However, after seven years, when Nulo Gopal died of plague, Alauddin Khan turned to instrumental music. He learned to play many indigenous and foreign musical instruments like sitar, flute, piccolo, mandolin, banjo, etc., from Amritalal Dutt, a cousin of swami vivekananda and the music director of the Star Theatre. At the same time, he learnt to play the violin in the western style from Mr Lobo, a Goanese bandmaster, and in the Indian style from Amar Das, a prominent musician. He also learnt staff notation from the wife of Mr Lobo. He learnt to play sanai, naquara, tiquara and jagajhampa from Hazari Ustad and pakhwaj, mridanga and tabla from Nandababu. Thus he became an expert in many instruments. He worked as a tabla player under an assumed name for some time in the Minerva Theatre. Then he was invited to perform at the court of Jagat Kishore Acharya, the zamindar of Muktagachha. There Alauddin Khan was attracted to the Sarod after listening to Ustad Ahmed Ali Khan, from whom he subsequently took lessons in the sarod for five years. Alauddin Khan then went to Rampur to take further lessons from Ustad Wazir Khan, a famous musician of the Tansen Gharana in India and the court musician of Hamed Ali Khan, nawab of Rampur. Alauddin mastered the difficult skill of the Sen Gharana. The nawab sent him to the durbar of Maihar Estate in Central Province, where he became the court musician of Brijanath, the Maharaja of Maihar Estate. Alauddin Khan learnt yoga, pranayam and dhyan under the influence of the pir (Muslim saint) of Bareilly. This page was last modified on 14 September 2014, at 12:06.